, an eminent English antiquary, was descended from an ancient family of the same name, resident at, and lords of the manor of Fauld in Staffordshire. His father, Daniel Astle, who was keeper of Needwood forest, died in 1774, and was buried in Yoxal church, where is a neat mural monument erected to his memory. 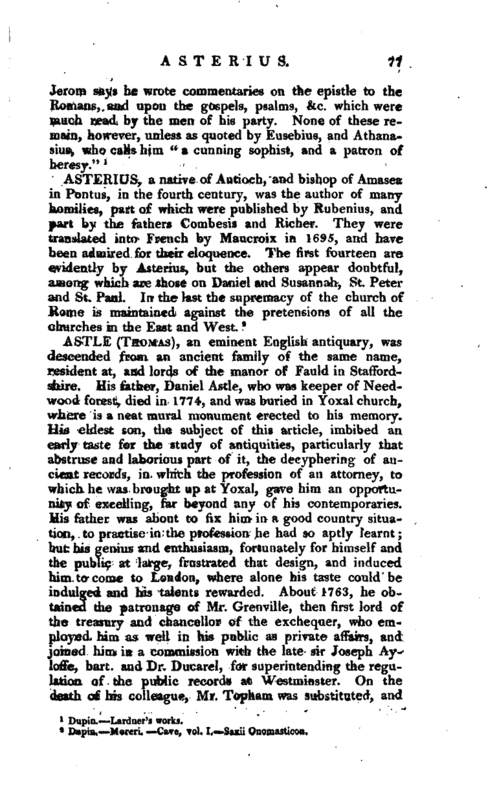 His eldest son, the subject of this article, imbibed an early taste for the study of antiquities, particularly that abstruse and laborious part of it, the decyphering of ancient records, in which the profession of an attorney, to which he was brought up at Yoxal, gave him an opportunity of excelling, far beyond any of his contemporaries. 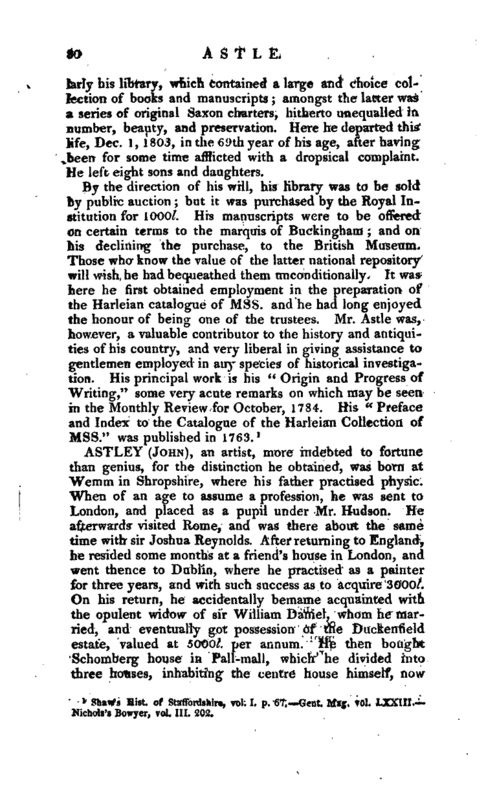 His father was about to fix him in a good country situation, to practise in the profession he had so aptly learnt; but his genius and enthusiasm, fortunately for himself and the public at large, frustrated that design, and induced him to come to London, where alone his taste could be indulged and his talents rewarded. About 1763, he obtained the patronage of Mr. Grenville, then first lord of the treasury and chancellor of the exchequer, who employed him as well in his public as private affairs, and joined him in a commission with the late sir Joseph Ayloffe, bart. and Dr. Ducarel, for superintending the regulation of the public records at Westminster. On the death of his colleague, Mr. Topham was substituted, and | both were removed by Mr. Pitt during his administration". Previously, however, to this, if we mistake not, he had enjoyed the patronage of lord Townshend, and soon after he was introduced to the rev. Philip Morant, author of the History of Essex, a gentleman of good property in that country, whose daughter and heiress he soon after married, and by that means, at her father’s death, possessed his estate. In 1765, he was appointed receiver-general of sixpence in the pound on the civil list. In 1766 he was consulted by the committee of the House of Lords, concerning the printing of the ancient records of parliament. To the superintendance of this work he introduced his father-in-law Mr. Morant; and on his death in 1770, was himself appointed by the House of Lords to carry on the work, a service in which he was employed till its completion five years afterwards. 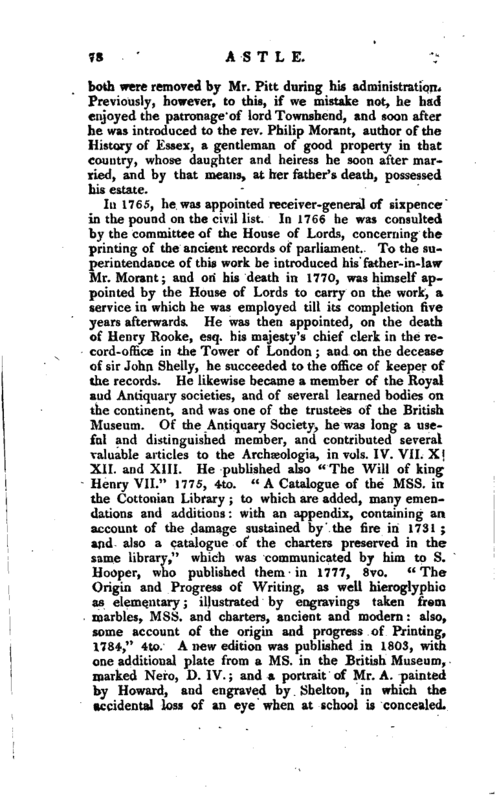 He was then appointed, on the death of Henry Rooke, esq. his majesty’s chief clerk in the record-office in the Tower of London and on the decease of sir John Shelly, he succeeded to the office of keeper of the records. He likewise became a member of the Royal and Antiquary societies, and of several learned bodies on the continent, and was one of the trustees of the British Museum. Of the Antiquary Society, he was long a useful and distinguished member, and contributed several valuable articles to the Archaeologia, in vols. IV. VII. XI XII. and XIII. He published also The Will of king Henry VII.“1775, 4 to.” A Catalogue of the Mss. in the Cottonian Library to which are added, many emendations and additions with an appendix, containing an account of the damage sustained by the fire in 1731 and also a catalogue of the charters preserved in the same library,“which was communicated by him to S. Hooper, who published them in 1777, 8vo.” The Origin and Progress of Writing, as well hieroglyphic as elementary illustrated by engravings taken frem, marbles, Mss. and charters, ancient and modern also, some account of the origin and progress of Printing, 1784,“4to. A new edition was published in 1803, with one additional plate from a ms. in the British Museum, marked Nero, D. IV. ; and a portrait of Mr. A. painted by Howard, and engraved by Shelton, in which the accidental loss of an eye when at school is concealed. | The Will of king Alfred,’* found in a register of Newminster, Winchester, in the possession of the rev. George North, and given by Dr. Lort, his executor, to Mr. Astle, 1769, was printed at Oxford, with the illustrations of Mr, Manning, under the superintendance of sir H. Croft, 1788, 4to.” An account of the Seals of the King’s Royal Burghs and Magnates of Scotland, with five plates, 1793," foJ. The Calendar to the Patent Rolls in the Tower of London, reaching from 3 John to 23 Edward IV. containing grants of offices and lands, restitutions of temporalities to bishops, abbots, and other ecclesiastical persons confirmations of grants made to bodies corporate, as well ecclesiastical as civil ‘, grants in fee farm special licences grants of offices special and general patents of creations of peers; and licences of all kinds which pass the great seal and on the backs of these rolls are commissions to justices of the peace, of sewers, and all commissions which pass the great seal. The Calendar of these Rolls, published by his Majesty’s command, in pursuance of an address of the House of Commons, on the report of the Commissioners for inquiring into the state of the Public Records, is printed from four ms volumes procured, in 1775, by Mr. Astle, for public use, from the executors of Henry Rooke, esq. 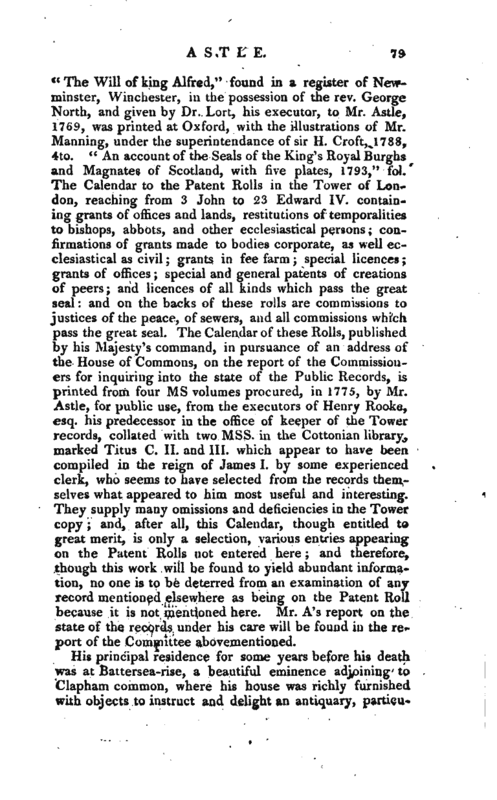 his predecessor in the office of keeper of the Tower records, collated with two Mss. in the Cottonian library, marked Titus C. II. and III. which appear to have been compiled in the reign of James I. by some experienced clerk, who seems to have selected from the records themselves what appeared to him most useful and interesting. They supply many omissions and deficiencies in the Tower copy and, after all, this Calendar, though entitled to great merit, is only a selection, various entries appearing on the Patent Rolls not entered here and therefore, though this work will be found to yield abundant information, no one is to be deterred from an examination of any record mentioned elsewhere as being on the Patent Roll because it is not mentioned here. Mr. A’s report on the state of the records under his care will be found in the report of the Committee abovementioned. His principal residence for some years before his deatji was at Battersea-rise, a beautiful eminence adjoining to Clapham common, where his house was richly furnished with objects to instruct and delight an antiquary, | particularly his library, which contained a large and choice collection of books and manuscripts amongst the latter was a series of original Saxon charters, hitherto unequalled in number, beauty, and preservation. Here he departed this life, Dec. 1, 1803, in the 69th year of his age after having been for some time afflicted with a dropsical complaint. He left eight sons and daughters. Shaw’s Hist, of Staffordshire, vol. I, p. 67.—Gent Mag, vol. LXXIII. — Nichols’s Bowyer, vol. III. 202.